This blog is a real time story of my current startup in the making (NOT a Fantasy), and I’m inviting you to help write its future history as a unicorn startup. Open innovation, also referred to as crowdsourced innovation, had often been used to use contributions made by a collaborative community to build new, innovative products. This Blog is essentially a CROWDSOURCING / OPEN INNOVATION PLATFORM to build an innovative startup company. The Unicorn is mythology’s only benevolent creature, the protectorate of the weak, and promoter of health and longevity. A Financial Unicorn is a startup with no established performance record, with a stock market valuation or estimated valuation of more than $1 billion. 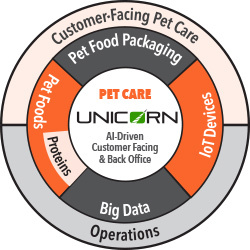 This Unicorn: Unicorn, Inc. is a benevolent pet food, nutrition tech, and pet wellness startup, engineered to become a financial unicorn. We’ve been in stealth for nearly three years. Our Sept. 2017 blog launch coincides with taking out our first $5 million capital raise. I’ll soon start posting investor responses as they come in (except the one includes a check with a confidentiality requirement). Every VC that declines investing moves us closer to the right investment partner. To join our Fantasy League and help build a UNICORN STARTUP, please add a Reply at the bottom of any post, then connect with me via LinkedIn so you’ll receive notices each time I broadcast new blog posts. I’ll listen hard, and work tirelessly to implement all excellent recommendations and advice that will help put “OUR” company on the short list of unicorn startups. I started Unicorn (the company) in late 2014, and patiently engineered the roadmap to become a financial unicorn. The three years of work, summarized in the various posts, reflects the lessons learned from my previous successful and not so successful startups, my study of many other tech startups (successes and failures), and my discovery and understanding of the 3-5 year trajectories of major factors that influence US markets. As you read through the blog articles, you’ll see how I have approached foundational development, structure, objectives and positioning, and you’ll glimpse some of the “secret sauce” that underpins our strategy to disrupt the huge, $31 billion US pet food industry. If you prefer direct dialog, just drop me an email (below). Blog reply, LinkedIn connection or email, as a founder eager for “two heads” collaboration, my replies will be swift. Now, let’s build that Unicorn!